The lawyer Pierre-Antoine Berryer gained fame as a rainmaker in the 19th century. That he became a lawyer was no coincidence because his fahter Pierre-Nicholas Berryer was also a lawyer. However Pierre-Antoine Berryer first was desirous to become a cleric and he joined the "Collège de Juilly" of the Oratorians. Finally he studied la wand in 1811 he was admitted as an advocate. At this time he was politically a Bonapartist but this soon changed and he became a Royalist. When king Ludwig XVIII had to go into exile in 1815m, Pierre-Antoine Berryer and his father followed him to Gent. When the so-called "Regime of Hundred Days" by Napoleon I ended, the king and the Berryers returned to France. There were actions against those generals who turned to Napoleon I. Pierre-Antoine Berryer pled for some of these generals although he was also forced to leave Paris at that time. General Debelle was sentenced to 10 years, general Cambronne was found not guilty. Because Berryer also lobbied for state-prosecuted journalists he soon was regarded as a intercessor for the freedom of press. In 1818 and 1820 followed two other startling defenses when he took over the mandate for the generals Canuel and Donnadieu who were significantly involved in the abolition of the rebellions in Lyon and Grenoble. Thank to his popularity Pierre-Antoine Berryer was also able to set a course politically. In 1830 he was elected to the national assembly for the department "Haute-Loire" and he pleaded for the abatement of the anti-monarchistic liberal tendencies. When Maria Karolina, Princess of Bourbon-Sicily, duchess of Berry tried to secure the throne for her son in 1832, Berryer tried to hold her off but unsuccessfully. When the duchess failed and came to the court Berryer defended her but without success. Because Berryer knew about her planned revolution previously he had to fear that he will be accused too. Therefore he tried to flee to Switzerland but was arrested and was indicted for co-conspiration. 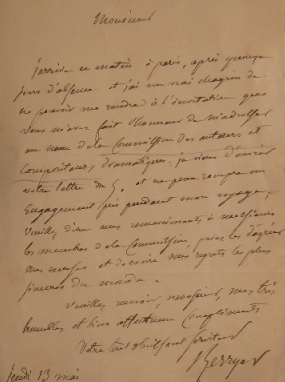 Pierre-Antoine Berryer took over his plea himself and achieved an acquittal. It followed other pleas for great personalites, among them François-René de Chateaubriand, a writer and politican as well as Napoleon III, who he defended in Boulogne-sur-Mer after an attempted coup. From 1851 Pierre-Antoine Berryer withdrew from the politcal floor a little and concentrated again to his lawyers' office. Still he tried to bring together the enmities Housees of Orleans and Bourbon and he argued without success against the French intervention in Mexico which took place in 1862. Today Pierre-Antoine Berryer has an excellent reputation as a exceptionally gifted speaker. In remembrance to Berryer young Parisian lawyers carry on rhetorical competitions calles "La Berryer". In the Parisian law courts stands a statue of Berry in the "Salles des Pas Perdus".